Since the negotiations started in 2005, Turkey’s accession process dominated by internal and external problems of the European Union and Turkey. While the “deepening” aspect of the integration more or less maintained its importance, as exemplified in the fiscal governance steps taken against Eurocrisis of 2009; the “widening” aspect, on the other hand, has clearly lost its momentum. In this regard, Turkey’s EU candidacy still poses a problematic position for the EU politics. In particular, recent developments in Turkey have completely changed the direction of EU accession agenda, which also increased anti-European discourse among the elites and public as well. 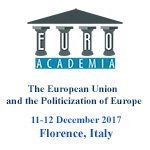 There is a well-developed literature focusing on the enlargement of European Union and significant amount of studies analysing individual states or enlargement rounds from the perspectives of institutionalist/rationalist theories. In this paper, I focus on Turkey-EU Refugee Deal as a case of study. Concluded in 2016 refugee deal constitutes an interesting mode of integration hence, it came in force almost in 6 months and has an immediate impact on the immigration policy. In this direction, first I discuss this process through the lens of the EU enlargement theories and test their recently developed assumptions particularly after 2009 Eurocrisis. Secondly, I delve into the question of why and how Turkey’s domestic problems lead to a Eurosceptic membership perspective. Considering Turkey’s turbulent transformation, this paper will contribute to the literature via shedding light on how EU membership can gain and lose its attractiveness so quickly and how domestic contestation determines the pace of reforms.